“We’ll just write some content”, that’s what web owners usually say. With the focus on the word ‘just’. I admit, writing web texts does not have to be rocket science. However, there is a large group, including me, that doesn’t “just” write a web text. For you to fully utilize the advantages of a well written web texts you have to use a thoughtful approach during your writing. The most difficult part for me was how to really come up with meaningful content that wil entice my target audience. Which features or product details to highlight, and how to go about it. When you’re working only on your own little island it can be difficult to see the bigger picture on how your web texts contributes to the success of your site. Questions like ‘Who are my target group/audience?’, ‘Will they find my text interesting?’, and especially, ‘Does my web text contribute to my (online) targets, like conversion?’ are important. Fortunately I wasn’t the only one with this issue. In my search for concrete handles I found the Myers-Briggs Type Indicator model, in short: the MBTI-model. This model is based on personas and helps to divide your target according to specific characteristics. The original model is based on the idea that (almost) eerybody can be classified within one of the sixteen categories of the model. The model gives insights on the different ways of decision making and the personality characteristics of your target group. For example, I see my target group expressed in this persona: an enthusiastic and creative person with an eye for opportunities in life. He or she prefers to work on his/her own, relatively quick ideas ideas and present them with full believe to his/her co-workers for feedback. Based on this information an EFNP-personality fits perfectly with this person: extravert, makes decisions based on emotion, they are open to feedback and works based on their intuition. These characteristics are useful to keep in mind while writing a web texts. For example, when someone makes decisions based on their emotions your text target could be: “to reinforce the connection with my readers” while a different persona could prefer more facts. This is no rocket science but good to keep in mind! For the practical use of the MBTI-model Roy Williams has simplified the sixteen personas. He based these personas on the preference in which the person makes decisions and whether or not they need time to make decisions. When you take these four personas into account while writing, you will service most of your online visitors. Competitive persons are mostly discount hunters. You can help them by showing clear advantages, like lower prices, sharp deals and delivery information. This persona would prefer it to be presented in a short list. Spontaneous persons are more emotional people. A good feeling is very important to them. Because they are fast decision makers as well it is important that they can see the advantages quickly. For writing your content this would mean: limited stock and temporary deals. Also service advantages will sound appealing to this person. Methodic persons have no difficulties taking time to make their decisions. They prefer to collect as much information as possible. Information for the methodic person can be deeply linked in the website. Also, proof, testimonies and guarantees will help this person in the decision making process. Humanistic persons are looking for a safe feeling. Pictures of people will attract their attention. Also, testimonials, an ‘about us’ page and ‘who also bought this product’ are interesting elements for the humanistic person. You can use the MBTI-model to shape your web page and to give it a better composure. Start with ‘What’s in it for me’ to help the competitive visitor make a decision quickly. Then, service the spontaneous person by showing service advantages. Add a human aspect, for example, how many other customers you already have. Eventually you can add more details, proof and guarantees for the methodic personas. 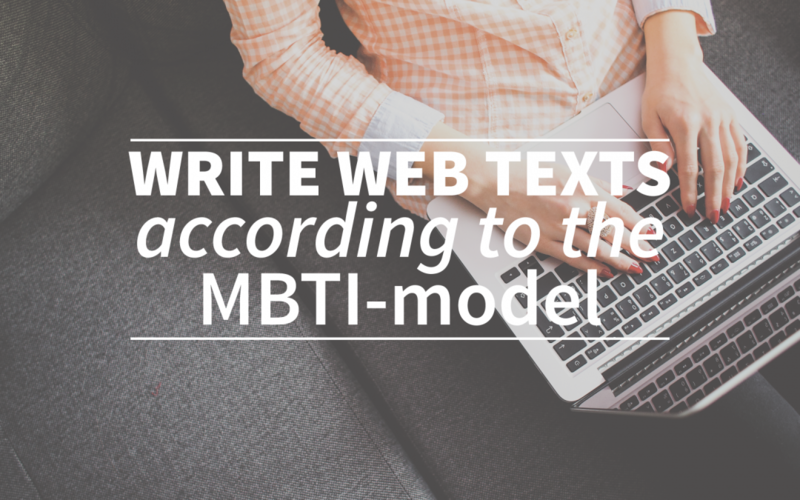 Using the MBTI-model as a tool you make your web texts contribute to your (online) targets. For example, lower bounce rates or generating conversions. I really like the idea that I can help the biggest part of the online visitors with these principles. Of course the optimization of your web texts is an ongoing process in which it remains important to put yourself in the shoes of your target group, involve them and learn from them. Your creative text directly SEO proof? Write your web texts in webtexttool. Try it for free! !